Designed by Dudley Dix and built by Jacobs Brothers in Cape Town, South Africa, ‘Ohana’ is a fantastic example of the Shearwater 39. She is powered by a Yanmar 4JH4E, 56hp diesel engine installed new in 2006. Her current engine hours are 3130 hours. 1) a fully battened Lee Sails mainsail (new in Oct. 2010) with three slab reefs in a full size cover, 2) A roller furling 130 genoa, 3) a roller furling Sobstad yankee, 4 & 5) two Crusader hank on staysails, 6) an American Sails trysail, 7) a Sobstad storm jib, and 8) a cruising chute. Four cockpit sheet winches: Two Lewmar SS 43 two speed with wincher tail grips and two Enkes aluminium 28 two speed, self tailing. One Enkes aluminium 18 self tailing, single speed mainsheet winch. All with canvass covers. Three mast winches: starboard side – Andersen SS 28 ST for the mainsail; port side – Enkes 20 ST for staysail; aft side – Enkes 20 reefing winch. Standing rigging was replaced in August 2017, as well as the head sail roller furler. The new roller furler is a ProFurler. Spars are from Bellamy Masts of Cape Town, South Africa. Spars were stripped of old paint and refinished with a clear coat finish, Seamaster whisker pole. 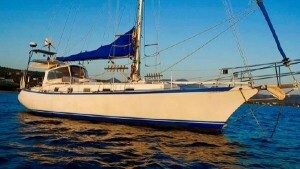 This Shearwater 39 provides accommodation for 7 guests, in two double berths and three single berths with lee cloths. The interior has a substantial headroom of 6ft 5in. This Shearwater 39 is also equipped with a Zodiac Cadet 270 Aero purchased new in 2017, powered by Honda 2.3hp outboard.